This standard is identical to ISO 14971:2007. In 2011 the European Commission raised a concern around the legal text supporting presumption of conformity to the Medical Device Directives (Annexes ZA, ZB, ZC) in EN ISO 14971:2009. The outcome was that CEN decided to publish a new edition of the standard (EN ISO 14971:2012). BS EN ISO 14971 is a key standard specifying a process for a manufacturer to identify the hazards associated with medical devices, including in vitro diagnostic (IVD) medical devices, to estimate and evaluate the associated risks, to control these risks, and to monitor the effectiveness of the controls. 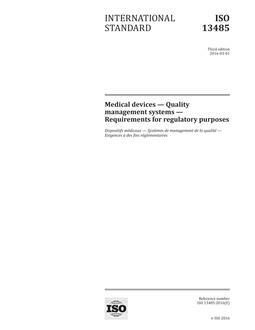 The requirements of this standard are applicable to all stages of the life-cycle of a medical device. It does not apply to clinical decision making, does not specify acceptable risk levels and does not require that the manufacturer have a quality management system in place. 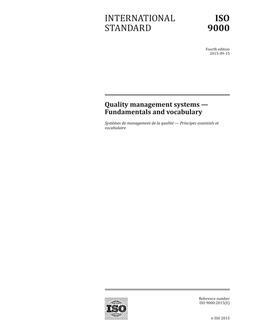 However, risk management can be an integral part of a quality management system. 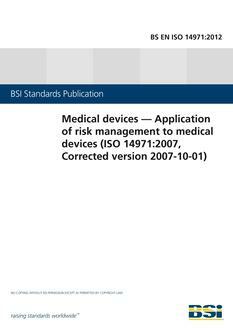 BS EN ISO 14971 was developed specifically for medical device/system manufacturers using established principles of risk management. For other manufacturers, e.g., in other healthcare industries, this standard could be used as informative guidance in developing and maintaining a risk management system and process. It deals with processes for managing risks, primarily to the patient, but also to the operator, other persons, other equipment and the environment. As a general concept, activities in which an individual, organization or government is involved can expose those or other stakeholders to hazards which can cause loss of or damage to something they value. Risk management is a complex subject because each stakeholder places a different value on the probability of harm occurring and its severity.